​We all go through challenging times in life. ​There are times when life seems harder ​due to trauma, injury, grief, or dealing with an illness. While yoga's mainstays of love, gratitude, & peacefulness are helpful, there are times in life when a different approach is needed. Similar to our lives, one of the amazing things about yoga is that it can be fluid and changeable. On a given day, you may feel drawn to an energized Vinyasa session. The next day, you may feel you really need more of a peaceful Yin session. Being aware of your internal signals. Being able to adapt to them ​on a given day can help keep you feeling healthy and peaceful. It's wonderful that your yoga practice can adapt to your current situation. Occasionally, your situation may feel painful, too hard, and outright unbearable. Loss and grief certainly ​negatively affect us emotionally ​and mentally. Yet, ​they can also impact us physically, as well. Experts tell us that the pain resides in your tissues - and when left untended​​, it can result in energy blocks, as well as trapped negative energy. Simply by including yoga - and purposeful mindfulness in our daily lives, we are able to help ourselves work through the current situation including ongoing illness, recent trauma, and the loss of a loved one. Yoga can be used as vehicle to help you empower yourself to tap into your inner strength and resiliency. It can help you move forward in life, regardless of your seemingly insurmountable challenges. Yoga can help us be reminded that just about everything is temporary in nature. ​Being willing to accept the notion of things being temporary can help us better adapt to trauma, illness, and grief. A directed approach to healing via yoga can help us recover more quickly. ​With the growth of in the popularity of yoga over the years, there may already be local yoga studios (or independent yogis) in your area who have dedicated classes specifically for helping people get through life's challenges. If you feel comfortable asking a few close friends for recommendations, you may be able to identify local yoga places​ that can help you. To find local yoga studios who may have just what you need, you can search Google using search phrases like "healing yoga + YOUR CITY", restorative yoga + YOUR City", etc. The following options may be more preferable to someone who would rather have a little more privacy during their challenging time. ​The Internet offers possible solutions - some for free and some paid. You may be able to find helpful yoga blogs or YouTube videos - ​using the search phrases above (just leave off the city part). You may have to hunt around, going back & forth a bit. But, it's free, and it may ​be just what you need. There are also paid offerings that are organized and specifically directed at those experiencing life's challenges. 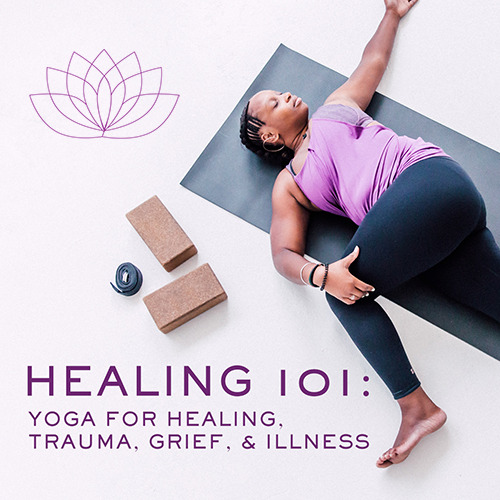 One of them is ​Yoga Download's Healing 101.​ ​They have classes specific to each unique challenge (i.e., trauma, loss, grief, or illness). And, they also include classes for overall healing - regardless of your current battle. Classes are gentle and centered on giving you a safe space to move through your emotions and heal. I hope that whatever it is that may be weighing you down now quickly becomes a distant memory. Doing nothing - and letting your situation fester seems to be a recipe prolonged challenge and unhappiness. Whatever you do, do something. Find yoga sessions locally or online, and take action with yoga to help you get through your challenging situation - and get back to feeling good again. ​(The map location may be off when using a wireless carrier connection. In that case, use the search box above & enter your city. ​If you buy a product or service after clicking ﻿a ﻿link on this website, we may receive a commission.